We're blessed with an amazingly productive apple tree. We make the most of it by canning up lots of applesauce, making hard cider, and drying lots of slices. Those dried slices get used in oatmeal, cookies, taken on hiking trips, and snacked upon greatly. Those also get used to make dried apple tea. This simple little drink is full of naturally sweet flavor and is open to numerous, tasty variations both hot and iced. Start with naturally dried apples. If you don't have your own buy something that doesn't have any additions, they should truly just be apples, no additional sugar or other ingredients. They don't have to be large apple rings either. If you find pieces or have your own pieces, that works just great in this tea. Dried apple tea is a tasty and refreshing all natural way to put those dried apples to use for a relaxing hot or iced drink. Put the dried apples into a cup. Pour 8 ounces of boiling water over the apples and cover the cup. Let steep 10 minutes before removing the apple slices, if desired. If making multiple cups, put the slices into a large pot and pour the boiling water over to be strained as the individual cups are poured. Iced Dried Apple Tea- Use 1/2 ounce of dried apples per 8 ounces of water and steep for 10 minutes as for hot tea. After straining, pour over ice and enjoy. Black Apple Tea – During the last 5 minutes of steeping, place a black tea bag in the cup to finish steeping with the apples. Sweeten or add milk as desired. Mint Apple Tea – During the last 5 minutes of steeping, place 2 teaspoons of dried mint (or a mint tea bag) in with the steeping apples and let it finish. Strain and enjoy. Ginger Apple Tea – Place a very small piece of dried ginger (less than 1/8 of an ounce) in with the apples and let it steep for the full 10 minutes. Beware, this can be very strong depending on the ginger and individual taste buds – experiment and adjust for individual tastes. Cinnamon Apple Tea – Place a small piece of cinnamon bark (a broken bit of a stick) in with the apples and let steep for 5-10 minutes with the apples. The longer it steeps, the stronger the cinnamon flavor. Strain and enjoy. Though, I haven't tried it personally, I imagine this method could work with many other dried fruits. 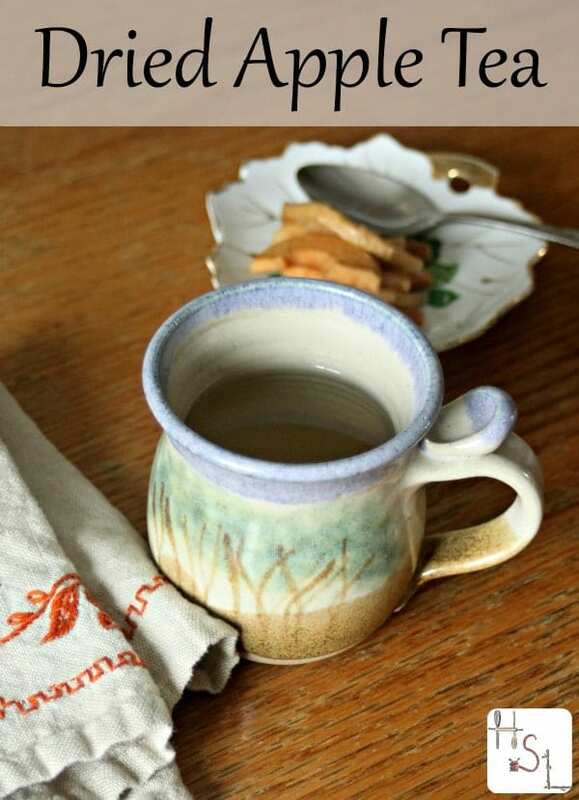 As the cold nights of January set in, make yourself a cup of fruitful, tasty dried apple tea to warm up and relax. Remember that it can easily be made in the hot days of July as well for a tasty and refreshing iced drink, too. January is National Hot Tea Month, I've teamed up with a number of other bloggers to bring you a collection of tasty, medicinal teas, ideas for using tea in daily life, recipes, and much more. You can follow along and participate with us by using the hashtag #MonthofTea on your favorite social media. Makes me wish my kids didn’t already eat the 40lbs of apples I dehydrated in October. Next year I’m hiding some for me! We do this with dewberries (wild blackberries), too. My sister dehydrates apples. Most people throw away the skins. They can be dehydrated, then ground to a powder to be added to a tea or to make a tea. In my humble opinion, the slices should be saved for yummy snacking! I usually leave the skins on my apples when I dehydrate or make applesauce for that matter. here I was wondering what to do with all the apples I dried, thank you. Oh, your welcome! Enjoy that. I dehydrated a TON of apples this Fall!!! I’m looking forward to trying this apple tea! I make a lot of different herbal teas, and perhaps the apples will go well in them too? Thanks for the inspiration! Oh for sure – mix bits of dried apples in other tea blends for a lovely flavor. Enjoy.